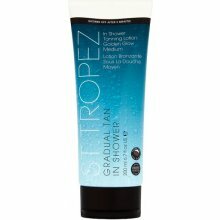 An innovative self-tan lotion used in the shower to deliver a natural-looking, buildable glow. The most convenient way to tan—simply apply in shower and rinse in just three minutes. Great for all skin tones and types, it delivers a natural-looking, bronze glow and extreme moisture without streaking or transferring onto clothing. It is made with a 100 percent natural DHA and infused with sweet almond oil to nourish the skin for a smooth, soft, hydrated finish. Use daily to gradually build an intense tan. For best results, use for three or more consecutive days. If you are looking to achieve a deeper tan, it’s important to not skip a day between applications since the color builds after each use. For an even darker glow, leave the lotion on your skin for up to five minutes before washing off. Apply generously as you can never over apply.